I love courgettes / zucchinis and this year I was hoping for many courgettes that I would be able to cook in many different ways trying out new and interesting recipes I have found in the blogging world. I planted twenty courgette plants earlier in the season and all the plants were doing very well when the floods of June washed the vegetable garden away. Most of my vegetables were lost as they sat in deep water for a week which rotted away the roots to the plants. I was pleased that two of my courgette plants have managed to survive the floods and now have courgettes growing. In a day or two I will be able to start picking these fabulous vegetables and I can’t wait. I am interested in hearing from anyone who has courgette and zucchini recipes that they would be willing for me to link to and even try out and review. 4) Fried courgette – a serving suggestion by farmingfriends. 10) Courgette soup suggested by me and The Cottage Smallholder. 12) Courgette chutney. A recipe by farmingfriends. 13) Chocolate And Courgette Loaf. A recipe by Pumpkin Soup. 15) Zucchini casserole. A recipe by Ms Green Thumb Jean. 16) Zucchini patties. A recipe by Shady Side Farm. 17) Lemony courgette salad a recipe by Joanna’s Food. 18) Vegetable soup with courgette flowers – suggested by TopVeg. 19) Ratatouille – suggested by Allotment Lady. 20) Zucchini fritters a recipe by Juile at Noshtalgia. 21) Courgette cake a recipe by Lucy at The Smallest Smallholding. Ed at The Slow Cook is wild about squash and has found lots of zucchini recipes in the Pittsburgh Gazette. Please let me know if you have a recipe for one of the courgette dishes above or a different courgette recipe and I will add the link to this article and the Courgette Explosion article. I look forward to hearing from you. 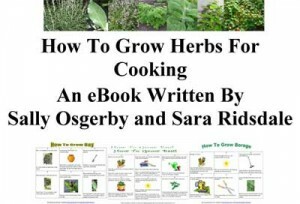 Check out the How To Grow Herbs For Cooking eBook For Only £3.00.